Spreadsheets are widely used by knowledge workers, especially in the industrial sector. Their methodology enables a well understood, easy and fast possibility to enter data. 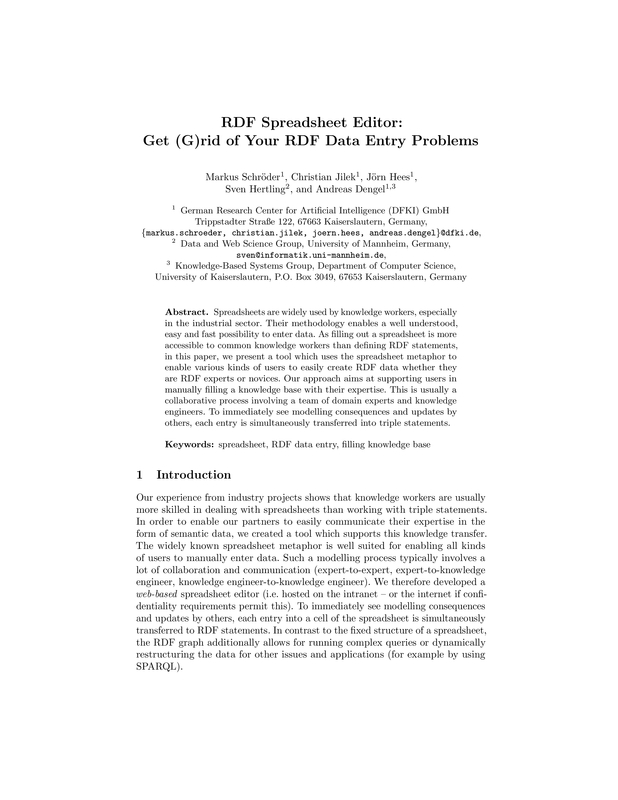 As filling out a spreadsheet is more accessible to common knowledge workers than defining RDF statements, in this paper, we present a tool which uses the spreadsheet metaphor to enable various kinds of users to easily create RDF data whether they are RDF experts or novices. Our approach aims at supporting users in manually filling a knowledge base with their expertise. This is usually a collaborative process involving a team of domain experts and knowledge engineers. To immediately see modelling consequences and updates by others, each entry is simultaneously transferred into triple statements.